Several car break-in incidents have occurred occurred in just over three months on N. Wolfe Road. Drivers should be warned about N. Wolfe Road car break-ins, particularly at the Cupertino Village shopping center and Vallco Mall. A look at crime blotters released by the Santa Clara County Sheriff’s Office shows repeated incidents of break-ins – 25 of the reported incidents occurred in just over three months on N. Wolfe Road. Of the incidents, 15 occurred at Cupertino Village shopping center at N. Wolfe and Homestead roads, while 9 occurred down the street at Vallco Mall. The blotter detailing the 25 incidents below report a total estimated loss of $241,536. Between 8:00 PM and 8:59 PM on 4/16, unknown suspect(s) broke through the windows of two vehicles parked near the Duke of Edinburgh in the Cupertino Village shopping center on N. Wolfe Road and took two bags, each containing a laptop, for a total loss of about $6,100. Between 10:00 PM and 10:52 PM on 4/17, unknown suspect(s) broke through the rear windows of a vehicle parked in the Cupertino Village shopping center and took a backpack containing a camera, cash and clothes for a total loss of about $4,220. Between 11:10 AM and 11:18 AM on 4/24, unknown suspect(s) broke through a window of a vehicle parked near 99 Ranch Market in the Cupertino Village shopping center on N. Wolfe Road. The trunk latch was engaged, the trunk searched, but nothing was taken from the vehicle. Between 3:00 PM and 4:16 PM, unknown suspect(s) broke through a window of a vehicle parked near the Benihana restaurant at Vallco Mall on N. Wolfe Road and took a wallet for a total loss of about $400. Between 7:10 PM and 8:15 PM on 4/30, unknown suspect(s) broke through a window of a vehicle parked near Nutrition Restaurant in the Cupertino Village shopping center on N. Wolfe Road and took a bag containing cash, a cellular phone and a laptop for a total loss of about $2,710. Between 7:00 AM and 7:30 PM on 5/4, unknown suspect(s) took the rear license plate off a vehicle while it was parked at Vallco Mall on N. Wolfe Road for an unknown total loss. Between 11:00 PM on 5/4 and 12:30 AM on 5/5, unknown suspect(s) broke through a window of a vehicle parked near Jade Galore in the Cupertino Village shopping center on N. Wolfe Road and took two backpacks, each containing a laptop, in addition to headphones and a wallet for a total loss of about $3,695. Between 12:15 PM and 1:40 PM on 5/8, unknown suspect(s) broke through the windows of two vehicles parked at the Benihana restaurant at Vallco Mall on N. Wolfe Road and took bags containing assorted electronics, cash, passports and other personal items for a total loss of about $21,700. Between 9:50 AM and 11:00 AM on 5/14, unknown suspect(s) broke through a window of a vehicle parked near Starbucks in the Cupertino Village shopping center on N. Wolfe Road and took a backpack containing a laptop and textbooks for an unknown total loss. Between 5:45 PM and 7:45 PM on 5/15, unknown suspect(s) broke through a window of a vehicle parked at Vallco Mall on N. Wolfe Road and took a backpack containing a laptop and a passport for a total loss of about $1,050. Between 12:05 PM and 1:10 PM on 5/18, unknown suspect(s) broke through the windows of two vehicles parked near 99 Ranch Market in the Cupertino Village shopping center on N. Wolfe Road and took backpacks containing electronics and a passport for a total loss of about $6,500. Between 10:00 PM and 10:25 PM on 5/21, unknown suspect(s) broke through the windows of two vehicles parked in the Cupertino Village shopping center on N. Wolfe Road and took business suits, electronics, foreign currencies and passports for a total loss of about $200,000. Between 7:15 PM and 8:59 PM on 5/25, unknown suspect(s) broke through the windows of two vehicles parked near 99 Ranch Market in the Cupertino Village shopping center on N. Wolfe Road and took a purse for a total loss of about $400. Between 9:00 PM and 10:43 PM on 5/25, unknown suspect(s) broke through a window of a vehicle parked in the Cupertino Village shopping center on N. Wolfe Road and took luggage containing clothing and other personal items for a total loss of about $1,250. Between 7:00 AM and 5:14 PM on 5/29, unknown suspect(s) broke through a window of a vehicle parked at Vallco Mall on N. Wolfe Road and took a camera for a total loss of about $1,500. Between 9:15 PM and 10:00 PM on 5/30, unknown suspect(s) entered an unlocked vehicle parked near Tofu Plus Korean BBQ in the Cupertino Village shopping center on N. Wolfe Road and took a backpack, camera and two laptops for a total loss of about $4,660. Between 3:00 PM and 5:49 PM on 6/4, unknown suspect(s) broke through a window of a vehicle parked at Vallco Mall on N. Wolfe Road. It is unknown if anything was taking from the vehicle. Between 10:00 PM and 11:00 PM on 6/4, unknown suspect(s) broke through a window of a vehicle parked near the Shanghai Family Restaurant in the Cupertino Village shopping center on N. Wolfe Road and took a bag containing two laptops and a passport for a total loss of about $3,050. Between 8:00 PM and 10:30 PM on 6/7, unknown suspect(s) broke through a window of a vehicle parked near Starbucks in the Cupertino Village shopping center on N. Wolfe Road and took an electronic tablet and a laptop for a total loss of about $1,600. Between 8:50 AM and 4:00 PM on 6/18, unknown suspect(s) broke through a window of a vehicle in a parking garage at Vallco Mall on N. Wolfe Road and took cash and vehicle insurance and registration paperwork for a total loss of about $60. Between 12:50 PM and 3:00 PM on 6/21, unknown suspect(s) broke through the windows of two vehicles parked near Benihana restaurant at Vallco Mall on N. Wolfe Road and took a backpack, clothing, debit card, driver’s license, school book and supplies, and a wallet for a total loss of about $146. Between 11:15 AM and 12:07 PM on 6/27, unknown suspect(s) broke through a window of a vehicle parked near Starbucks in the Cupertino Village shopping center on N. Wolfe Road and took luggage containing clothes and jewelry for a total loss of about $2,000. Between 8:55 AM and 5:10 PM on 7/1 , unknown suspect(s) entered a vehicle in a parking garage at Vallco Mall on N. Wolfe Road by forcing a window open to access the door’s lock. The suspect(s) took the car stereo and a pair of sunglasses for a total loss of about $600. Between 9:15 PM and 11:05 PM on 7/6, unknown suspect(s) broke through a window of a vehicle parked near 99 Ranch Market in the Cupertino Village shopping center on N. Wolfe Road and took a bag containing a laptop and a stethoscope for a total loss of about $1,425. 4 Comments on "Car burglary incidents common at Cupertino Village and Vallco Mall"
I was in contact with the Cupertino Village management (KimCo Realty) after my car was broken into TWICE in 6 months in the lot there. Both times well lit areas. They’ve apparently done nothing to improve security. Shame. I will avoid that lot, and the businesses, until the situation improves. 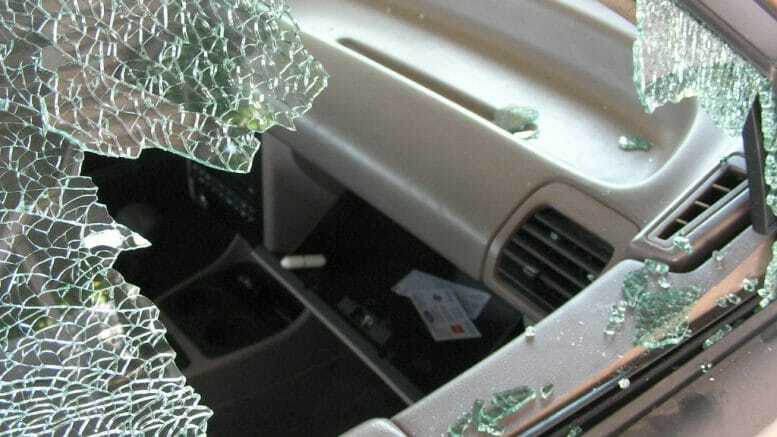 Why do ppl leave valuables in a car. Ppl are stupid to do so. Poor no stakout since crime is prevalant their. What are the police doing about it? Guess nothing since crime continues. As of August 20th, the police still do absolutely NOTHING to stop these burglaries from happening. In all these incidents the suspect(s) were never caught. What the hell is Sheriff’s Office doing? Set up security cameras, assign patrols, or do anything to try to stop this from happening. This type of crime is happening way too frequently right now especially in a nice area like Cupertino. I live in Arioso apartments. Car also was robbed. Arioso has sent pictures of the thieves to santa clara PD. not sure why they aren’t caught.